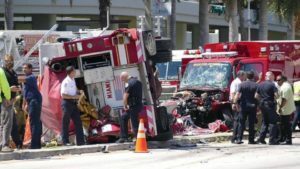 Miami-Dade Emergency Vehicles driving through intersections has been a long standing concern for drivers in the Miami area. The Altman Law Firm has handled accident cases involving this issue in the past and is currently representing an injured client involved in a collision with an Emergency Vehicle at an intersection. Florida Statute 316.072 governs the traffic privileges and obligations of operators of Emergency Vehicles on public roads. Contrary to the belief of some, Emergency Vehicles do not simply have the right to go through a red light at an intersection without first complying with other obligations. Specifically, the driver of an Emergency Vehicle may (1) proceed past a red or stop signal or stop sign, but only after slowing down as may be necessary for safe operation; (2) Exceed the maximum speed so long as the driver does not endanger life or property; (3) Disregard regulations governing direction or movement or turning in specified directions, so long as the driver does not endanger life or property. However, the law also states, the privileges and obligations described shall not relieve the driver of an Emergency Vehicle from the duty to drive with due regard for the safety of all persons or protect the driver from the consequences of his or her reckless disregard for the safety of others. Simply stated, Emergency Vehicles are not permitted to just drive through an intersection because they may have lights and sirens on – they must first ensure that they can proceed through the intersection safely. It is clear that the majority of operators of Emergency Vehicles follow the law and we are blessed to have them in this profession. 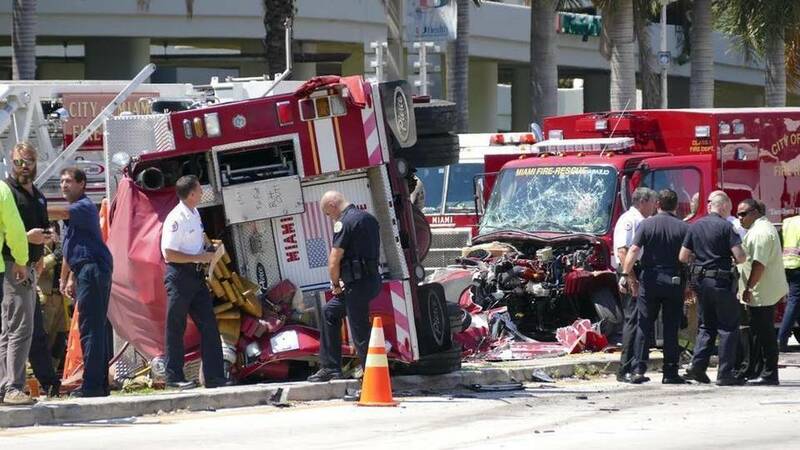 However, if the public believes that operators of Emergency Vehicles always follow the law – all they need to do is look at the case of the August 11, 2015 intersection collision between two Fire Rescue Vehicles right around the corner from Jackson Memorial Hospital. Both vehicles proceeded through the intersection causing a massive collision injuring 12 people. Common sense dictates that at least one of the vehicles did not follow procedure of making sure it was safe to proceed through the intersection. Based on personal experience and news reports like this, when we hear stories of drivers that report an Emergency Vehicle failed to have sirens and lights on and sped though a red light – it is certainly believable. Jeffrey S. Altman of The Altman Law Firm has been exclusively handling injury cases since 1998. Our office is located on Biscayne Boulevard and 108th Street. We are minutes from North Miami, Miami Shores, North Miami Beach, Aventura, South Beach and Sunny Isles Beach. We handle many different type of injury cases but our firm focuses on Traumatic Brain Injury and Wrongful Death cases. If you or a family member would like a Free Consultation with Mr. Altman to discuss an injury case, please call 305-373-3730, 888-991-2889 or email Mr. Altman at jaltman@altmanlawfirm.com.